Tech Center: Razer Switchblade for mobile casual PC gaming experience. Razer Switchblade for mobile casual PC gaming experience. Las Vegas: CES 2011 featured a new concept gaming device code named "Switchblade" developed by the company Razer, one of the world's leading brand of high-end precision gaming products. 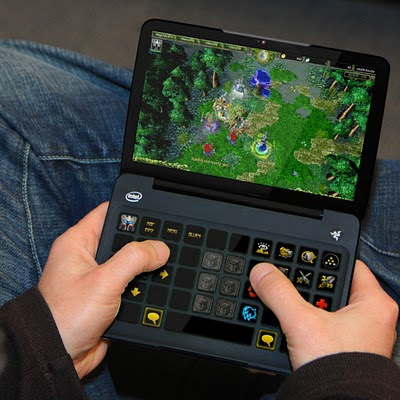 The main problem with developing the a mobile PC gaming device is the problem of replicating the functionality of the keyboard and mouse in a portable device. That's what this concept device tries to overcome. This design of the device is something never seen before.The dimensions of the device are 172 x 115 x 25mm (6.77 x 4.52 x 0.98 inches). 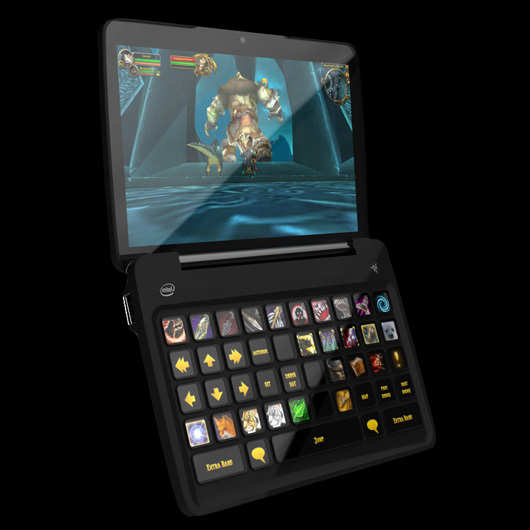 It has a an amazing dynamic tactile keyboard that adjusts its configuration based on current game being played and user requirements each key is a tiny touch screen, that's what makes it one of a kind. For the mouse it has an ultra sensitive multi-touch screen. WiFi, Bluetooth, 3G connectivity, USB-3.0, 3.5mm Audio Jacks, Mic. A detailed specification of the device has not been reviled yet. The device can be compared to a netbook. I think it is more for the casual games and not for the high end side considering the fact that it has an Intel Atom processor. But the main thing is the fact that we have a new physical user interface which is a great leap in input hardware technology. With a tactile keyboard and a touch screen. The device is in a prototype stage and no word about its release or price have been disclosed. This device is a result of 2 years of R&amp;D by Razer.